Cases of whooping cough are making a comeback in the U.S.
PHOENIX (FOX 10) -- Cases of whooping cough are making a comeback in the United States. Known officially as pertussis, the highly contagious respiratory infection causes severe bouts of coughing that mimic a "whooping" sound. Despite a vaccine, health officials have seen a jump in the number of cases in recent decades. According to the Centers for Disease Control, there were fewer than 2,000 cases in the U.S. in the 1970s and 1980s, but that jumped to over 48,000 cases in 2012. And while those numbers are down from that peak, they are still not as low as when the vaccine was made available. Studies of pertussis from the Journal of the American Medical Association say unvaccinated children are contributing to the outbreaks. "Pertussis (whooping cough) can cause serious illness in babies, children, teens, and adults. Symptoms of pertussis usually develop within five to 10 days after you are exposed. Sometimes pertussis symptoms do not develop for as long as three weeks," according to the CDC. Early symptoms that can last one to two weeks include: runny nose, low-grade fever, a mild, occasional cough and apnea. After one to two weeks, Later-stage symptoms appear as the disease progresses: rapid coughs followed by the high-pitched whoop sound, vomiting and exhaustion. 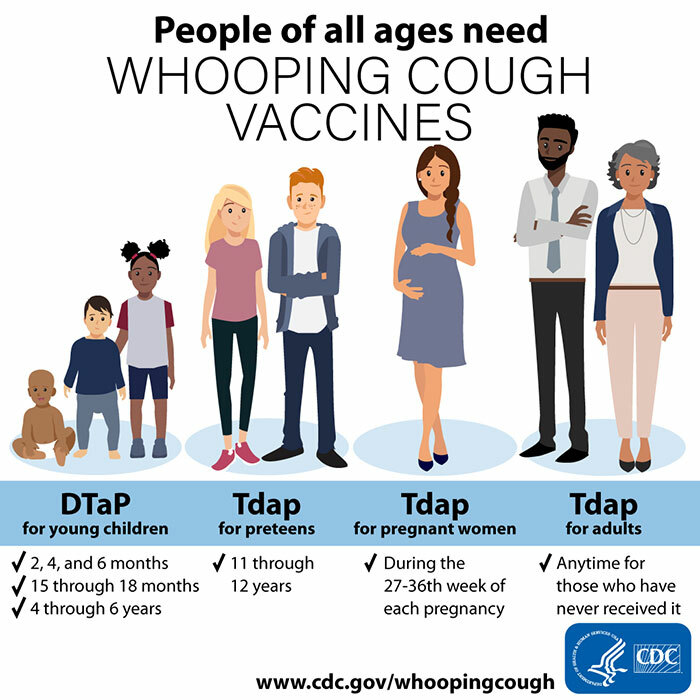 The CDC recommends babies receive the DTaP, a series of shots with a combination vaccine, including pertussis, beginning at two months of age. This can help protect against three diseases: diphtheria, tetanus and pertussis. "It is important to know that many babies with pertussis don’t cough at all. Instead it causes them to stop breathing and turn blue." They also recommend adults get a booster shot, called Tdap, every 10 years. It also contains protection against tetanus, diphtheria and pertussis. Israeli media reported the 43-year-old woman slipped into a deep coma 10 days ago and had suffered encephalitis, or inflammation of the brain. The attendant was breathing through a respirator, reported The Times of Israel . An outbreak of the measles virus occurred in New York City, Rockland County, New York and in Israel. Infections were mostly centered in ultra-Orthodox communities were vaccination rates were low.